The most effective way to lose weight is to find a diet plan and workout regime that work together. A carb cycling diet workout plan may just be your best bet for weight loss. It allows you to have a balance between high carb and low carb days, and cycle between muscle-building exercise and fat loss workouts. With a carb cycling diet plan, you get the versatility that allows you to grow strong and fit, while also losing fat. 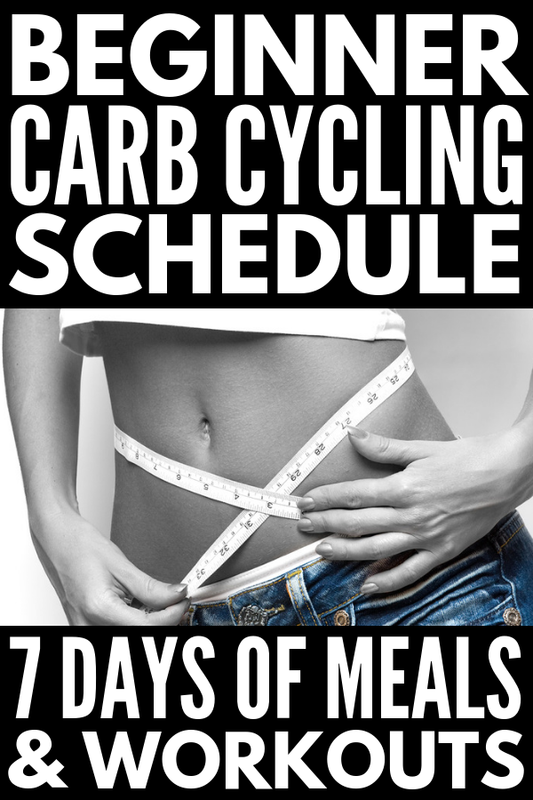 Take a look at this awesome 7-day carb cycling plan for beginners and beyond! Carb cycling is exactly what it sounds like. You cycle between low carb and high carb days six to seven days a week. You can choose to keep the seventh day as a reward day, but it’s up to you and your weight loss goals. Eating carbs on certain days helps boost your metabolism, while sticking to veggies and protein on the other days keeps your insulin levels low, burning fat, without affecting muscle loss. If you’re starting carb cycling for weight loss, a good goal would be to aim for five low carb days scattered with two high carb days. Make sure not to put your high carb days back-to-back. You want to space them out evenly throughout the week for best results. This helps eliminate cravings and minimizes stress hormone levels. When you space out your meals into smaller serving sizes throughout the day, your body will have a better response to cortisol, the stress hormone, which triggers sweet cravings. Vegetables and fibre are really important on a carb cycling diet. Fibre helps regulate blood sugar, resulting in regulated body weight, so make sure to get it at every meal. Unprocessed, whole foods must be at the top of your list on a carb cycling diet. These foods will boost your health and help you lose weight fast. Cutting out flavoured beverages is key to a successful diet plan. Stick to water and unsweetened teas/black coffee if you really want to see some good weight loss progress! Most sauces are really high in carbs. Sauces like ketchup, barbecue sauce, salad dressings and stir fry sauces can throw you off track, so stick to herbs and spices for your meal flavourings. Can I Exercise While on the Carb Cycling Diet? You can absolutely exercise while on the carb cycling diet, and in fact, exercise can actually boost the benefits of carb cycling. A carb cycling plan that integrates a healthy eating plan along with exercise will be most effective for weight loss. To get the best results, you can alternate between high and low carb days depending on the exercise you have planned for that day. High carb days should be paired with muscle-building exercises, such as weight lifting. Carbs help open up your cells and allow for protein to come in, accelerating muscle growth. On the other hand, low carb days are for fat burning. When your body can’t find any carbs (its usual fuel source), it starts burning fat for energy instead. Low carb days are the days you should do your cardio and HIIT workouts. Really, any workout the targets your smaller muscle groups is ideal. This 7-day carb cycling workout plan is perfect for beginners looking to start the carb cycling diet plan and lose weight by integrating proper workouts! Try it out and see the results for yourself! If you loved this 7-day carb cycling workout plan, please share this post on Pinterest. And if you want more weight loss tips and tricks, please follow our Health Board on Pinterest.